Hoy, PetroChina salía a la bolsa de Shanghai y se convertía en la mayor compañía del mundo a precio de mercado (1tillón de dólares), más grande que Microsfot, Ford, etc. Y naturalmente también en la petrolera más grande del mundo, doblando su precio de mercado al de Exxon. La boragine inversora por PetroChina ha sido tan fuerte que la bolsa de Shanghai ha superado la de Londres tras esta incorporación. En el primer dia de cotizaciones en Shanghai, su precio aumentó dos veces y media el precio inicial, al mismo tiempo que su cotización en Hong Kong caía un 8%. Sin embargo PetroChina no es considerada ni una de las 50 compañías más grandes del mundo y el 86% sigue siendo de propiedad estatal. Asi, ¿que esta pasando? Parece que la borágine inversora en China está provocando una burbuja de dimensiones considerables, sin embargo también debe considerarse que los inversores podrían estar evaluando las perspectivas futuras de la compañía, a la que se le augura un futuro muy prometedor de continuar el crecimiento económico chino y el persistente incremento del precio del crudo (un 10% en China la última semana). Ya veremos como acabo todo esto, mientras tanto aprovecho por recomendar el nuevo dossier de Cartografare il Presente sobre el mercado energético (los mapas del post son de allí). Sin duda la web, disponible en italiano, francés e inglés tiene muchísimos recursos interesantes a explorar, no solo mapas, y también recomendaría Edizione 2006/2007. L’Asia orientale nell’economia politica globale (P. S. Golub) o el especial sobre el Caspio. Hawksley in YaleGlobal: Today, a confident China bankrolls bad government in the Sudan and Zimbabwe and in the scramble for natural resources, has aspirations to control politically uncommitted swathes of the African continent. Extreme Islam has taken grip in Somalia, Nigeria and beyond and creeps toward cocoa farms of the Ivory Coast. While inflexible thinking about state control over the economy by the hard left contributed to the collapse of communism, it may be the inflexibility of the free-market right that threatens the future of Western liberal democracy. “China’s oil diplomacy is putting the country on a collision course with the US and Western Europe, which have imposed sanctions on some of the countries where China is doing business,” commented William Mellor of Bloomberg News. The sentiment is echoed by the other side. “I see China and the US coming into conflict over energy in the years ahead,” said Jin Riguang, an oil-and-gas adviser to the Chinese government and a member of the Standing Committee of the Chinese People’s Political Consultative Council. China appears to believe that it can secure its energy imports by locking up oil contracts with pariah states like Sudan. However, while this short-sighted mercantilist approach creates foreign policy problems over issues like Darfur, it will not really protect China in a time of supply disruption. It would be far better to bring China (and India) into the IEA, and encourage normal Chinese participation in world markets. This year, China will surpass the US in emissions of greenhouse gases. It builds nearly two new coal-fired electricity plants each week. In such a world, energy security can no longer be summed up as greater energy independence. Instead, we must find better ways to cope with energy interdependence. Even with its strength as one of the world’s largest oil producers, Iran is dependent on foreign energy and is taking stiff measures to rectify the situation. To many, Iran is an energy giant. The country possesses over a quarter of the world’s known oil and gas reserves. It is the second largest oil producer among OPEC countries and it has abundant natural resources which make it ideal for producing electricity. Vast inefficiencies and abnormalities, however, mar this idyllic picture. Iran’s oil production has been declining steadily from its pre-revolution peak of 6 million barrels per day (bpd) to its present 4 million bpd – below its OPEC quota – due to war, sanctions, low investment and depletion. Iran’s consumption of petrol has increased at 11 percent per year. If the present trend continues, by 2015, Iran will have become a net importer of petrol. The Islamic Republic’s official GDP is approximately US$196 billion. Yet, according to the newspaper Hamshahri, each year, the government spends roughly US$55 billion for the country’s energy needs including US$35 million in direct subsidies. In other words, 28 percent of the economic output is spent on basic energy needs. These huge and cheap energy inputs are needed to run the largely inefficient state-owned enterprises, to placate the public with dirt-cheap utility rates and to help out Iran’s strategic friends around the world. Without any doubt, petrol wastage occupies the prime place among all of the various economic distortions in Iran. Despite its enormous oil reserves, Iran imports 43 percent of its petrol needs from other countries due primarily to huge domestic demands as well as lack of sufficient refining capacity. The country’s average daily use is around 70 million liters per day, roughly equal to China’s daily consumption, but the latter’s population is 18 times larger. Economists attribute several factors for this situation. These include gas-inefficient automobiles, high population growth, the voraciousness of consumers and its super cheap petrol prices. Until 27 June, petrol was 9 cents a liter, making it among the cheapest in the world. It takes no more than US$5 to fill up a car in Iran, compared to US$40 on the average in the US and US$90 in neighboring Turkey. With Iran’s highly protected automobile industry and cheap financing – spurred on by President Mahmoud Ahmadinejad’s encouragement of car sales – manufacturers have no incentive to produce gas-efficient cars. According to a study by the financial newspaper Donay-e Eghtesad, 30 percent of the cars currently in use, consume 3 times more petrol than the international average. One of the most glaring by-products of the abnormally cheap gasoline prices is crossborder smuggling. According to the newspaper Siasat-e Rooz, smuggled petrol from Iran accounts for 10 to 14 percent of Pakistan’s fuel needs. Iran shares vast border areas with Iraq, Pakistan, Turkey and other states; too vast for law enforcement forces to fully patrol. Mules, pick-up trucks, and tankers line up at major crossing points each day to carry Iran’s heavily subsidized gasoline to other countries. The arbitrage could be quite huge. Iran’s anti-traffiking chief has been quoted in reports as saying that petrol smuggling is more profitable – and much less risky – than narcotics trafficking. According to an 8 July report in the newspaper Iran, petrol prices are more than 20 times higher in Turkey, 10 times higher in Pakistan and northern Iraq and 7 times higher in Afghanistan . “Oil is both Iran’s strategic strong point and its strategic weak point,” an Iranian political scientist told ISN Security Watch on the condition of anonymity. “It has given the state an unrivaled ability for maneuvering in both the domestic and the global spheres. Aside from these factors, the academic pointed to the looming threat of economic sanctions should Iran’s relations with the US and the international community deteriorate further. US President George W Bush recently renewed a bill imposing sanctions on international companies that invest more than US$20 million in the Iranian energy sector. More ominously for Iran, in June, the US House of Representatives proposed legislature designed to curtail Iran gasoline imports through punitive measures against financial and business entities that assist Iran. If signed into law, these companies would be denied access to the US market. According to the academic, Iran’s leadership has belatedly come to take note of these dangers and take action to remedy the situation. On the night of 27 June, with three hours notice, the Iranian government announced that automobiles would be allowed only 100 liters per month and the price would be raised to 11 cents per liter. The announcement was followed by rioting – complete with angry mobs burning down several gas stations and looting some government-owned stores – and motorists lining up to take advantage of the last few hours of cheap petrol. Despite these missteps, the measure seems to have worked. In the first week after the new rationing program was introduced, traffic was down by 25 percent and petrol consumption was reduced by 28 percent. For the first time in years, it was possible to drive in Tehran without being affected by its notorious traffic jams and air pollution. As far as smuggling, the news daily Ressalat reported that in northern Iraq, petrol prices had gone up from 950 dinars (77 cents) per liter to 1,300 dinars. To reduce its dependence on imported fuel, the government is seeking US$14 billion to build new refineries and modernize the existing nine in operation. Although US pressures may make it very difficult to come up with the entire sum, there are a few willing partners that may ignore or side step this. In addition to these measures, the Iranian Oil Ministry is encouraging the conversion of cars to run on natural gas, which the Islamic Republic possesses in great amounts. Iran is also using its global relationships with friendly countries like Venezuela and Indonesia to counter the effects of sanctions and ensure that the flow of petrol would not be stopped. According to the BP report and RFE/RL, the years of production that Kazakhstan has at present levels of extraction is 76.5 years; Azerbaijan, 29.3 years; Turkmenistan, 9.2 years; and Russia, 22.3 years. (…) Ideally, states use that “oil revenue window” to develop a varied economy using oil income as a jumpstart for a new economic engine. I like the concept “oil revenue window”, and then the post continues refering to the resources trap and dutch disease theories (but don’t mention them) that the Foreign Policy magazine have reviewed not very long ago (see Petropolitics). From my point of view, improving governance is the best way to solve all the problems and challenges of the “oil revenue windows”, but to do that in only 10 years in Turkmenistan looks impossible so this country is going to miss the oil revenue window for sure. 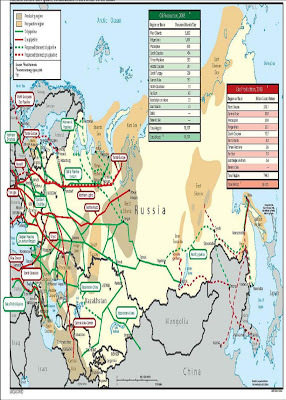 But we should not forget that Turkmenistan is much richer in gas than oil, so fso according to Planete Energies, could spend 30 more years on its “gas revenue winidow”, a much better perspective. to be met by fossil fuels. the net decrease in the number of people without electricity will occur only after 2015. 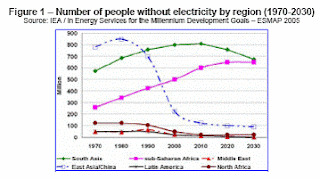 The levels of the electricity-deprived will fall in Asia, but will continue to increase in Africa.